Rios Clementi Hale Studios cheekily calls their concept the “Incredible Edible House” (extract from Wall Street Journal). This somewhat fantastical design seems to be as much about the future of food production as architecture. The façade of the three-story abode is slathered in a vertical garden that includes chickpeas, tomatoes, arugula and green tea. Step outside in the morning and harvest your meals. The plants both nourish the inhabitants and provide shade and cooling, absorbing heat better than a wall made of wood, brick, stucco or glass. Rios Clementi Hale, based in Los Angeles, has a reputation for playful and innovative designs. Its best-known works include the angular red, ochre and green-striped campus of the California Endowment in downtown Los Angeles. It has also done designs for Hollywood powers such as Walt Disney’s Robert Iger and movie and music impresario David Geffen. But the plants aren’t the only striking feature of the design. 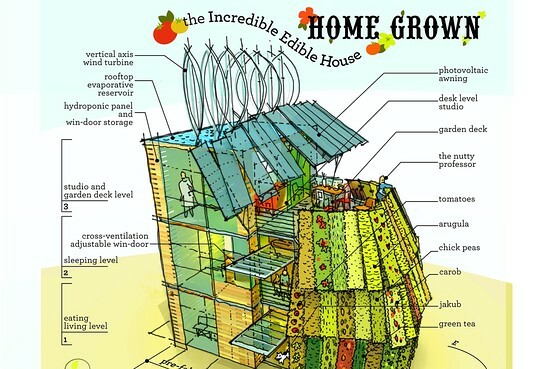 At three stories, the edible house is also more vertical than the typical suburban home, a nod to the importance of building dense, urban-style houses in order to reduce energy use. A rooftop reservoir collects water and keeps the building cool; rooftop windmills generate energy. The house is also put together in an intriguing way: It’s made of three prefabricated containers stacked on top of each other that can be moved on a trailer if the mood fits. This method exists today, but it’s not used very much, since homeowners associate prefabrication with lower-end homes. But the benefits for lowering energy use are substantial. The standardized construction in prefabricated homes reduces defects that can hamper energy conservation. And it’s easier to ship prefabricated parts, which means reduced fuel use for deliveries.